The Howard Hughes Corp. is going before the Hawaii Community Development Authority Wednesday and Thursday in public hearings as it seeks variances for its plans to develop a Whole Foods Market-anchored mixed-use project for the former Nordstrom Rack location, known as Block M, as part of its Ward Village master plan. PBN met Tuesday night with Nick Vanderboom, senior vice president of development for Dallas-based Howard Hughes Corp. (NYSE: HHC), and architects from Bohlin Cywinski Jackson, for an exclusive first look at the project. Bounded by Queen and Kamakee streets, Block M is behind the Ward Entertainment Center and is currently the site of an Office Depot and the former Nordstrom Rack. 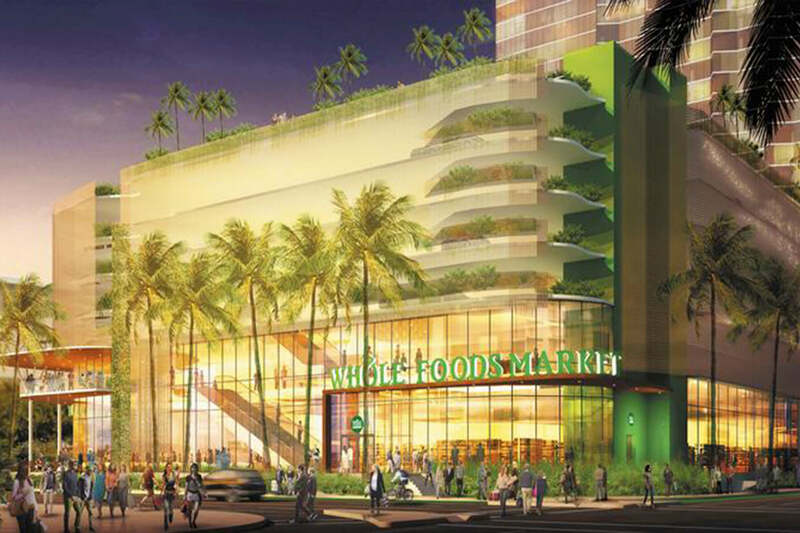 Plans include a 50,000-square-foot Whole Foods Market, plus another 12,000 square feet of retail and more than 700 parking spaces in a block-filling podium to be topped with a narrow high-rise offering about 466 residential units. Bohlin Cywinski Jackson is partnering with Architects Hawaii Ltd. on the Block M project. With offices in Pennsylvania, California and Washington state, BCJ has designed such projects the Fifth Avenue Apple Store in New York, Seattle’s City Hall and the headquarters of Pixar Animation Studio. · One variance sought is permission to make the retail/parking podium height 75 feet, matching that of the Anaha project to go up across Kamakee Street, on the site of the former Pier 1 Imports. “This is the best way we can offer enough parking not only for the residents, but for the customers of Whole Foods, the other retail spaces, the Ward theaters and surrounding area,” said Vanderboom. The amount of parking being sought is based in part on their observations of parking demands at Kahala Mall since Whole Foods Market opened there. · A second variance seeks to orient the residential tower mauka-makai, to preserve view planes. “We believe that will make the building appear lighter and thinner,” said Miller. · The theme guiding the aesthetics of the Block M project is “wind,” in contrast to the oceanic themes that influenced the Waiea and Anaha projects. “One of the things we like to do is take the invisible flows of nature and make them visible in architecture,” said Miller. Bohlin Cywinski Jackson is exploring perforated metal skins for the podium, to be creased in ways that suggest wind patterns. Details in the tower’s glass façade will carry the theme upward. · Pricing has not been determined, but Vanderboom said that, with smaller units being planned, the project will likely be priced lower than Waiea or Anaha and appeal to a broader range of buyers. The project’s overall budget is not set yet at this time. · The tower is currently unnamed. “We’re working with our cultural descendants to find something appropriate,” said Vanderboom.The name is also likely to play off the theme of wind. · A decision on the variances from HCDA could be reached in January. Construction could begin in 2015. “We’d like to do the entire project all at once, but are looking for the flexibility to build the Whole Foods Market, retail and parking first, and the tower later, if market conditions suggest that,” said Vanderboom. Howard Hughes Corp.‘s design strategy is to match a different pairing of a notable Mainland architecture firm and a local firm for each discrete project, giving variety to each tower within the context of the Ward Village master plan. On Monday, PBN approached Howard Hughes to confirm word from a source outside that company, who preferred to remain anonymous, that famed architect Frank Gehry — who designed the Walt Disney Concert Hall in Los Angeles and the Guggenheim Museum in Bilbao, Spain — had recently been in Honolulu to meet with Howard Hughes officials.